Grilling outside has come a long way from burgers and hot dogs! Now you have the options of grilling, rotisserie cooking, and smoking your meats or fish—but don’t stop there! You can use your grill to cook your vegetables and even fruits. All you need are a few accessories to add to your basic grill, and you are all set to prepare the entire meal, from appetizers to dessert. This is a list of 10 accessories that will help you to create the entire meal on your grill. Tongs and spatulas. You may think you can get by using your kitchen set of tongs and spatulas, but don’t do it. The grill can be high heat, and you will need tools made to reach across the grill, so long handles are a must for both safety and convenience. These tools are used outdoors, so purchase tools that won’t rust, like stainless steel. There are wonderful grill tool sets available that would be ideal for the beginner grill master. Skewers. If you’re ready to move on from hot dog and burgers, one of the first and easiest meals to prepare on the grill is making kabobs. Put shrimp or pieces of meat on the skewers, and baste with your favorite sauce if you want. Use separate skewers for veggies, such as onion quarters, peppers, and cherry tomatoes. The skewers make it easy to flip the food to have uniform cooking, and the presentation on a bed of rice or alone on the plate next to a salad is beautiful as well as appetizing. Heat-resistant silicone gloves. These silicone gloves are heat resistant to 425 degrees. They make turning the skewers, reaching across the grill to baste food, or removing food from the hot grill a breeze. They are a great accessory to add to your grilling arsenal. Grill basket. These baskets are invaluable if you like to grill delicate foods such as fish. You place the fish into the basket and close the lid, so, when you are ready to turn the fish, you flip the entire basket. The fish will remain intact. These baskets are also great for veggies that could fall between the grate or be damaged while trying to flip them with the spatula. Meat claws. These heavy-duty dishwasher-safe tools are great for shredding the meat you’ve roasted on the grill for barbecue, but they are also great for easily moving a whole chicken or roast to the platter for serving. These tools are a definite must-have. Smoker Box. A smoker box is filled with wood chips such as hickory, apple, or mesquite, and in no time the wood-scented flavor will permeate the food you are grilling. This is especially great if you are using a gas grill and still want the flavor of a fire grill. Rotisserie. 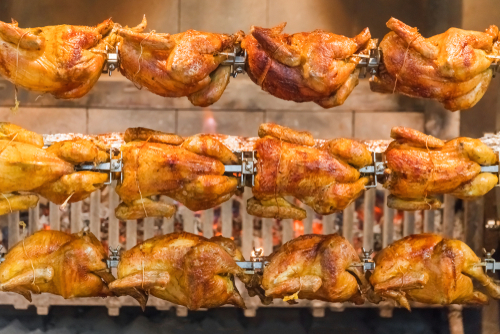 A rotisserie is another great tool that will increase your outdoor cooking options. Check with the manufacturer of your grill. Most portable outdoor grills have rotisseries made specifically for your grill. Quesadilla grilling basket. This is a fun accessory for making quesadilla on your grill. 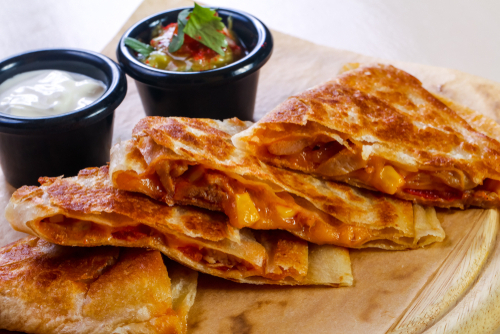 The basket opens, and you can assemble the quesadilla with whatever filling you prefer. Then you simply fold the basket shut, lock, and place on the grill to cook. It is easy to flip for grilling both sides, and there is no mess or any ingredients escaping. It is an unexpected food prepared on the grill and will probably be the hit of your next backyard pool party! Grate brush. Part of successful food preparation on your portable outdoor grill is maintaining your equipment. Your grill tool set should include a good grate brush. Every time you use your grill, brush any leftover food particles and debris from the grate. This will have your grill ready for your next outdoor cooking adventure. Whether you are grilling for a party or your family, next to your backyard pool, or on your portable outdoor grill at the park, think outside the box and have fun using your grill.